1) Always practice safe pruning and never operate power equipment with out proper safety equipment and training. 2) Cut to the branch collar not through it. Most branches have a swelling at the base at the point of attachment. Don’t cut into the swollen part of the branch, just cut outside it even if it leaves a bump on the side of the tree. 3) When cutting the ends off long evergreens try not to cut any more than 1/3rd of the length of the green growth area of the limb (don’t count the length of the bare stem). 4) Usually you should try to cut to a lateral limb. 5) Topping of trees should not be done unless they are Evergreens used to create a hedge or screen, fruit trees, and small ornamental trees. Topping of mature trees creates an area of decay and rot. Topping encourages the growth sucker limbs, which grow faster than the original top and are weakly attached. Call A & L Tree Experts, we are licensed Arborists, and will evaluate your trees and give you an estimate for the cost of the work. 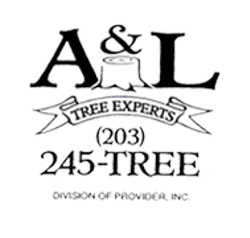 Call today for an appointment (203) 245-TREE.